The UNB Art Centre is pleased to announce the second exhibition of its 75th Anniversary celebration, Pieces of the Past: The Rug Designs of Pegi Nicol MacLeod & The Puppet Theatre of Lucy Jarvis which runs from March 18 through May 13, 2016. The exhibition will open with the launch of Roslyn Rosenfeld’s book Lucy Jarvis: Even Stones Have Life on March 18 from 5 – 7 pm A joint publication of the Beaverbrook Art Gallery and Goose Lane Editions, copies of the book will be available for sale at the opening and at the UNB Bookstore. While both Pegi Nicol Macleod and Lucy Jarvis were well known as painters, Pieces of the Past takes a closer look at their lesser-known creative works. To help make ends meet, Pegi Nicol MacLeod sold her rug designs at Madge Smith’s iconic shop on Queen Street. They feature playful images of New Brunswick’s flora and fauna, unifying art and craft in a practical yet beautiful domestic application. A popular pastime of the day, hooked rugs were a way to introduce cheerful colour and warmth into the home using scraps and ends. Hooking a rug or matt from an original design by an artist was a way to demonstrate good taste and an upscale household. Also on view are seven hooked rugs based on these designs, on loan from the Fredericton Region Museum. In addition, ArtZone, UNB’s student collective, will re-create a large painted rug based on one of Pegi’s fiddlehead designs as an homage to the artist who made such an impact on Fredericton culture during her short but impressive career. Many Frederictonians will be familiar with the marionettes on display from such popular performances as Peter and the Wolf, Jack and the Beanstalk, The Night Before Christmas and others. First conceived during the post-war years, productions were held in the UNB Art Centre’s temporary home at Alexander College, then later in the huts at UNB, as well as The Old Arts Building, (now known as Sir Howard Douglas Hall) and more recently in Memorial Hall. The puppet mechanisms were made by Richard Grant, then a demonstrator in geology at UNB. While Lucy Jarvis painted the faces and sets, other familiar Art Centre names were credited for their involvement with these productions, including Bruno Bobak, Molly Lamb Bobak, Marjory Donaldson, and Donald Reichert among others. Colin Mackay (then-president of UNB) was renowned for his narration of The Night Before Christmas, and Jarvis’ puppet theatre became an honoured Christmas tradition for the UNB community. In more recent revivals of Peter and the Wolf, the Fredericton Chamber Orchestra performed the accompanying score. The UNB Art Centre is thrilled to display these treasured pieces of both UNB’s and Fredericton’s heritage to the community once again. The UNB Art Centre will also host several special events throughout the exhibition’s run. On Friday, April 8, at 7:30 p.m., local actress Maria Bourgeois will present her theatrical performance To Live Dangerously. Part séance, part play, this performance will bring Lucy Jarvis back to the Art Centre once more! 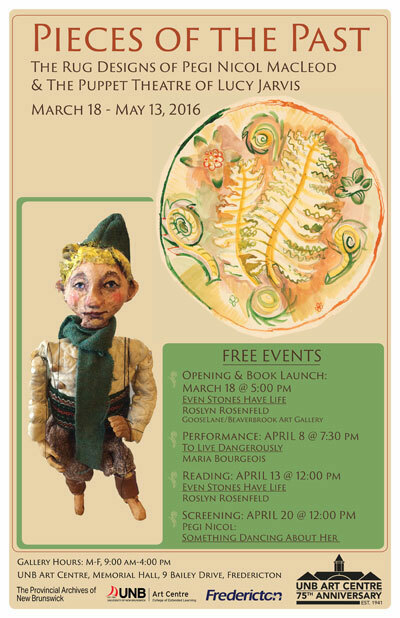 On Wednesday, April 13, at 12 noon, Roslyn Rosenfeld will read from Even Stones Have Life. On Wednesday, April 20, at 12 noon, the UNB Art Centre will host a special screening of Something Dancing About Her, a biopic about Pegi Nicol MacLeod. The UNB Art Centre will present the Finding Lucy Jarvis Antiques Roadshow with Roslyn Rosenfeld, and Alison and Mark Connell on April 30 at 1 pm. Please join us throughout 2016 as we celebrate the creative spirit of the UNB Art Centre and its place within the university and the local community over the past 75 years. The UNB Art Centre is located at Memorial Hall, 9 Bailey Drive, University of New Brunswick, Fredericton. The galleries are open 9 am - 4 pm weekdays and for special events. Admission is free to members of the public.